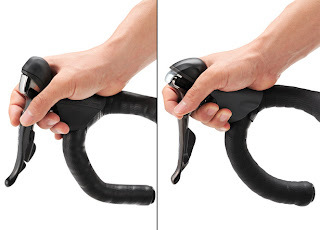 Shimano claims that the new shifting group reduces rear shift effort by 47% and front shift effort by 43%. One way they have accomplished this is by reducing lever throw by 30 percent. Lever throw is the distance you need to move each lever in order to actuate a shift. The new Shimano shifters' level blades are shaped to give the rider a better grip when braking from the hoods—because most riders spend the majority of the time riding on them. 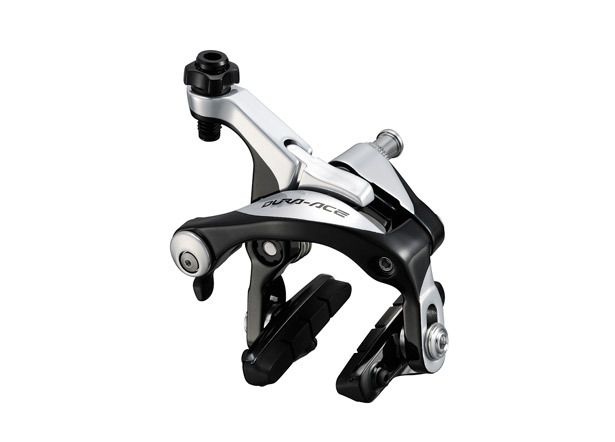 Shimano also adjusted the lever reach by 10mm, and the hoods use a dual rubber compound to improve grip. The 9000 series includes seven wheels, which fall into two categories: Blade carbon aero wheels, and lower profile Accelerating Speed carbon wheels. The Blade is available in either a 50mm (clincher or tubular) or 75mm depth (only tubular). The Accelerating Speed lineup optimizes power transfer comes in 24mm (clincher and road tubeless) and 35mm (clincher and tubular). The new 9000 crank is 52 grams lighter than the previous Dura-Ace version. Most of the savings come courtesy of a new four-arm design, instead of the five arms found on earlier groups. They claim it is just as stiff as the old crank, thanks to a new design that counteracts the naturally uneven power of the pedal stroke. Both the standard and compact cranks use a 110 BCD bolt pattern and Shimano adds two new climbing-friendly mid-compact chainring combos: 52/36T and 52/38T. 20% more powerful than the Dura-Ace 7900- says Shimano. The improvement comes from the caliper design, which has a shorter arm and a symmetric dual axle to pivot the pads toward the brake surface. The calipers are designed to go on wider rims, which are becoming more popular. The PD-9000 simply offers new graphic and fit options. For instance: a rider who likes a wider stance, Shimano will sell axles that are 4mm wider. Shimano also updated their cleats to pivot from the nose instead of the center. This will eliminate the lateral movement of cleats from previous years, and will have one degree of float instead of three. The cassette is now 11-speed and available in the following configurations: 11-23, 25, or 28 and 12-25, or 28. Visit Scheller's Fitness and Cycling at any of our 6 convenient locations. That's right! 6 Locations! In case you hadn't heard, we have opened a location in Evansville!